Oops - we don't appear to have a video for the DocuMate 632. The Documate 632 that we bought from you a short while ago has worked out so well we purchased another one from yourselves yesterday. The software is easy to use and the quality and speed of the scans is fantastic. I would give this product a rating of 10/10. The machine is currently in a workshop environment were dust has caused a problem for us in the past, however; since we bought the 632 machine about 2 months ago we average nearly 700 pages a day, and we have had no problems what so ever with the scanner. Further more, I was delighted with the level of service and updates we received regarding the purchase of the machine. It is very refreshing to be kept informed with everything that is happening with the machine you purchase without having to phone and enquire to it's whereabouts. Keep up the good work. The Visioneer Xerox DocuMate 632 document management scanner is a departmental duplex flatbed scanner that scans up to 70 images per minute (ipm) in duplex mode. The 8.5 x 14.5 flatbed is the only departmental scanner that can be programmed to automatically scan to 99 different customizable applications or devices. Documents can be converted to text-searchable PDF in one easy step. Now you can instantly search documents for keywords or phrases. The DocuMate 632's one-step installation is a snap with the plug and play Hi-Speed USB 2.0 port. The Xerox DocuMate 632 is the price/performance solution perfect for company wide scanning requirements. Xerox offers this model at a price that enables businesses to achieve high levels of productivity by distributing fast cost-effective departmental scanners throughout the organization. From Sarbanes-Oxley to the Patriot Act, records and paper management has become an important part of doing business. Today's trend is that more and more scanning is moving from the centralized offices and agencies to the departmental where the documents are received and can be processed immediately into electronic files that can be securely and accurately stored, transmitted and retrieved. The US Government is broadly standardizing on Adobe's PDF file format and the DocuMate 632 easily converts scanned documents into text-searchable PDF files at the press of a single button. Law offices, courts, clients and administrators handle and manage substantial quantities of paper. Documents are the substance of communication, reference, negotiation and execution of contracts, laws and evidence. Paper is expensive to store and retrieve. Scanning incoming and legacy documents into text-searchable PDF with the DocuMate 632 changes the entire document paradigm in a law office. It is useful for document archiving as well as Electronic Case Filing, which US District Courts now accept, but only in PDF format. The DocuMate 632's powerful software, robust functionally and hardware specifications delivers the speed and quality for departmental scanning. 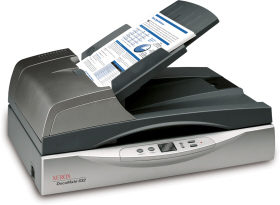 Scanning flexibility for nearly any document through the high-speed ADF or on the legal size flatbed, multiple file format options including text-searchable PDF, and the 6500 page per day duty cycle accommodates the office organization environment. The bundled Kofax VRS software provides such capabilities as autoexposure and wide angle deskew. VRS also helps improve the accuracy of recognition software, thereby reducing the need for manual correction of intelligent character recognition and OCR results. Document size is not an issue for the DocuMate 632. It scans everything from business cards and photos up to legal-size documents, with superior image quality. DocuMate 632's one touch feature lets you send documents to preselected destinations, including searchable PDF. Quickly turn PDF files and stacks of papers into easily editable word processing and spreadsheet documents. The Xerox DocuMate 632 includes an ISIS driver certified by Pixel Translations and an advanced TWAIN driver developed by JFL Peripheral Solutions to ensure that the scanner will function properly with the more than 250 commercially available ISIS-compatible applications and communicate effectively with enterprise content management (ECM) and document image management (DIM) software solutions with the press of a single button. Software That Gets the Job Done The DocuMate 632's robust software suite includes comprehensive ISIS and TWAIN support.